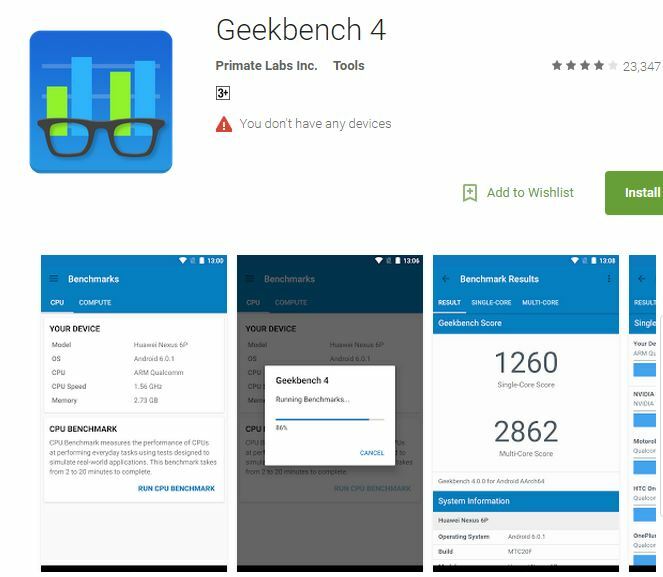 Geekbench 4.1 Download Install apk Android File. Geekbench is popular benchmarking tool, the app has been updated to version 4.1. Geekbench 4.1 comes with improved features. The benchmark tool comes with improvement in CPU and other computing tasks. Built with Android NDK 13b, it also enables the AArch32 Cryptography instructions. Geekbench 4.1 as a requirement works on devices running the Android 5.0 Operating System or later. Other features of the Geekbench 4.1 include, Change SQLite, Change Memory Latency workload to avoid cache hits on Cortex A72-A73, Change SQLite, LLVM workloads to improve multi-core scalability, Convert Histogram Equalization, Change HTML5 DOM workload to reduce performance differences across platforms, Sobel to use RenderScript intrinsics.